By next school year, students arriving at the Portland Community College's Rock Creek campus along Springville Road will have a new entrance and exit to the school, located only several hundred feet to the west of the current one. On Tuesday, the Washington County Department of Land Use & Transportation held an open house to showcase plans for a $7.8 million project that not only funds the new entrance but will widen Springville Road between 181st Avenue and Concordia Court. 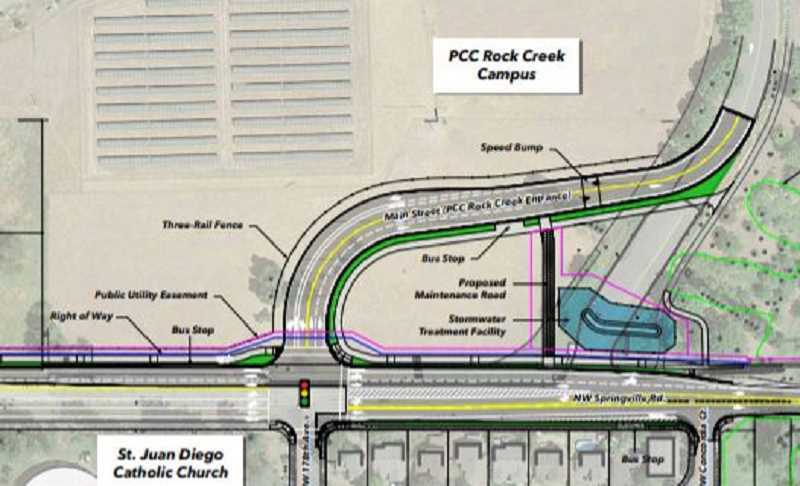 Phase II of the transportation department's plans call for the new entrance/exit to the campus to be located directly north of the 178th Avenue and Springville Road intersection (across the street from St. Juan Diego Catholic Church). Plans call for a double turn lane from eastbound Springville Road into campus while a single turn lane will be constructed for students entering the college headed westbound on Springville Road, according to transportation officials. A traffic signal will be installed at the 178th Avenue and Springville Road intersection as well. The new entrance will almost parallel Springville Road inside the campus and will hook up internally near where the soon-to-be-former entrance is now located. Meanwhile, those exiting the new PCC Rock Creek entrance onto Springville Road will be allowed to turn right or left only with no one allowed to continue straight through the 178th Avenue neighborhood. "We start in a couple of weeks," said Matt Meier, project manager for the Washington County Department of Land Use & Transportation. The goal is to have the entire project substantially completed – paving, a new signal up and running, and signage in place – by Sept. 15, ahead of community college students returning to school. "This will be a huge benefit for decreasing congestion and decreasing delays," said Meier. Springville Road sees an average daily traffic count of approximately 15,000 vehicles. When the new entrance is completed, the old one will be sealed off. In addition to widening Springville Road from 181st avenue to Concordia, sidewalks, bike lanes, landscaping and street lighting will be added as well. Also, a 10-foot wide interior asphalt path for bicyclists and pedestrians is being built on the north side of Springville Road as it feeds into the campus, according to officials. The project also includes adding sidewalks to connect with existing sidewalks on the north side of Springville Road between the campus and Samuel Drive. Construction is being funded through the Major Streets Transportation Improvement Program, also called MSTIP, along with the county's Transportation Development Tax, all in partnership with Portland Community College. Last September, the county finished Phase I of the Springville Road project with a major overhaul of the Springville Road/185th Avenue intersection.